Janet Jay joined us a few months ago for a windsurfing adventure. She wrote a fun article (with cool photos!) documenting the experience. I think it nicely captures the experience of learning to windsurf. Best of all, I'm quoted in it! Ok, that isn't really the best part. I really liked her reasons for windsurfing. 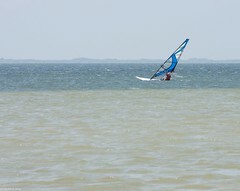 Try windsurfing, you will have fun.